Poor animal care in the circus may not always be intentional, but it is basically unavoidable, given the mobile nature of circuses and the temporary enclosures, living spaces and trailers that the animals must inhabit. Even reptiles, which are extremely difficult to care for, due to their highly specialized needs, such as specific temperature and light requirements, are currently legal in circuses. The constant moving and the changing environmental conditions cause disruption of normal behavioral patterns, which are likely to leave animals vulnerable to stress and disease. For example, McGreevy (2004) describes how the timing of sleep is very important in horses. Horses prefer to sleep in the early afternoon, so there should be a minimum of activity at this time. However, in the circus, transport, training and performances do not take this into account. Enclosures with a restricted amount of space can create a stressful environment for an animal. When animals are housed in groups, the space restrictions can precipitate increased aggression between individuals, where lower ranking animals cannot escape, and more injuries occur through fighting (Cassinello and Pieters, 2000). It is widely accepted by the zoo industry that environmental enrichment – the process of improving or enhancing animal environments and care within the context of behavioral biology, i.e., keeping the animals as close as possible to their natural environments (Young, 2003) – is essential to the welfare of captive animals. Environmental enrichment is a dynamic process, requiring species-specific modifications, which circuses cannot provide in a meaningful way. 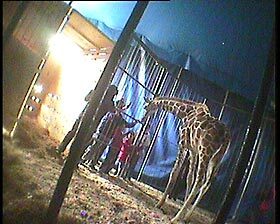 The high level of abnormal behavior that ADI Field Officers have observed in circus animals testifies to the absence of useful environmental stimulation. In the wild, grazing or browsing animals (classified as ungulates) spend a large part of their day eating. Circuses cannot provide permanent outdoor paddocks for grazing, so animals are often confined to indoor stalls or their trailers. ADI Field Officers have observed that even when outdoor paddocks are provided, they can be on concrete, tarmac or whatever surface is available. Sites tend to maximize audience space, rather than cater to animals. This severely restricts the ability of these specialized animals to carry out their natural feeding behaviors. In the wild, giraffes use their tongues to remove tree leaves and avoid thorns. The absence of this specific challenge in captivity creates a “behavioral vacuum,” and the resultant frustration can cause oral stereotypic behaviors, such as excessive licking, bar biting and tongue playing (Bashaw et al., 2001). The number of hours an animal is housed indoors can be used to predict the occurrence of stereotypic licking behaviors in grazing or browsing species (Bashaw et al., 2001). A frustrated feeding motivation may also result in motion stereotypies, such as pacing (Bashaw et al., 2001). Indoor enclosures often mean less variety of stimulation than outdoor enclosures, conditions that are very important for reducing the occurrence of stereotypic behaviors in general (Bashaw et al., 2001). Farmed deer who are housed indoors during winter exhibit higher levels of aggression, resulting in more injuries to each other, than deer who are confined outdoors in a pasture. Indoor deer also show an increase in behaviors like ‘chewing’ each other and their enclosure (Pollard and Littlejohn, 1998). Dama gazelles show more aggression towards their herd-mates, particularly dominant individuals, when housed in smaller enclosures (Cassinello and Pieters, 2000). A survey of 257 zoo-housed giraffes and okapis found that almost 80 percent of the animals showed at least one form of stereotypy (Bashaw et al., 2001). Captivity influences the behavior and breeding success of male and female black rhinos differently. Males are affected by a limited enclosure area and by ambient odors, such as a chlorine disinfectant. Female black rhinos are sensitive and react negatively to some aspect of concrete enclosure walls, either the acoustical properties or the visual separation from other black rhinos. A high degree of public accessibility along the perimeter of their enclosures is a potential stressor for both sexes, but especially males. Mortality in captive black rhinos was strongly linked to the percentage of public access along the perimeter of their enclosures. Another study found that captive black rhinoceroses appear predisposed to a skin disease not found in wild black rhinos. This disease was linked to periods of physical or environmental stress, such as capture, transport, sudden cold or the introduction of a new rhinoceros (Munson et al., 1998). It was also suggested that the unvaried diet of captive rhinos, compared to that of their wild counterparts (more than 200 species of plants) may play a role in the development of this disease. The studies of grazing or browsing animals demonstrate the complexity of captive animals’ needs and confirm that traveling circuses simply cannot address those needs. Non-human primates are our closest relatives. They are highly intelligent, use tools, show bonds of compassion and live in close family groups; they have the capacity to suffer in captivity, just as we would ourselves. Chimpanzees share 98 percent of our genetic makeup and have been shown to display compassion, jealousy, anger and fear. It is widely acknowledged that chimpanzees have awareness and intelligence comparable to that of a small human child. Yet the very survival of all the primate nations who share our planet is threatened by human exploitation. It is perhaps not surprising that we lack respect for our primate cousins when for centuries we have treated them as mere objects to amuse us – dressing them, ridiculing them, forcing them to perform silly tricks, debasing ourselves in the process. In circuses our shameful past is kept alive. Apes and monkeys are enslaved, caged and chained. Their lives are shattered. Violence and psychological abuse are used to make them perform. Primates used in television, advertising and movies are no better off. Performing animal suppliers require regular one-to-one contact with a young primate to maintain control, dependence and obedience. Thus, the trainer deprives primates of normal social contact with their own kind, locking them into a lonely world where affection is handed out as a prize for compliance. The chimpanzee’s smile which you so often see in films, advertising or the circus is, in reality, a grimace of fear. It is a sad irony that it is our empathy for these creatures that is being exploited by the cynical advertiser, looking for a new and ‘amusing’ way to sell another product. Elephants are the largest mammals walking the earth. In the wild they travel up to 13 miles a day, eating, bathing, enjoying a family life with complex social interactions, even mourning their dead. As these herds move, they transform the landscape, helping the regeneration of the environment. Yet in the circus, these intelligent, social beings are commonly shackled by one front and one rear leg as a method of control and confinement. This means that they cannot exhibit most of their typical behaviors. It also restricts social interactions, because contact is limited only to the elephant shackled beside them (Schmid, 1995). Although many circuses now claim to give their elephants regular access to a pen or outdoor enclosure, the elephants’ free time is limited when the circus is always on the move, and the elephants have to be prepared for their performances. ADI Field Officers have observed elephants commonly chained overnight, from the time the workers finish their day to when they arrive the next day. This can mean over half the elephants’ time is spent chained to the ground. Even when elephants are unchained, the exercise spaces are inadequate. Consequently, stereotypies occur in captive elephants, regardless of the method of animal care used. One study of circus elephants found that, “Weaving was the most common stereotypic behavior in the elephants, regardless of whether they were picketed (chained) or penned” (Friend and Parker, 1999). Another study which saw stereotypic behaviors in all the elephants observed, concluded that “the welfare of closely confined elephants can be poor” (Kirden and Broom, 2002). High levels of stereotypic and abnormal behaviors were observed in all the elephants involved in the Kirden and Broom study, which was undertaken in a circus holding facility. This study showed that stereotypic behavior differs between individuals and that changing the methods of animal care (i.e. shackling versus unshackling), only reduces stereotypies in some individuals. For some elephants it was impossible to identify one underlying cause of stereotypy. Many aspects of the circus environment were found to cause stereotypic behaviors in elephants, such as the lack of social contact, anticipation of food or another significant predictable event, the presence or absence of people, the size of their enclosure, and their proximity to other specific individual elephants. It was also observed that in addition to stereotypies, some circus elephants show other types of abnormal behaviors, such as prolonged inactivity, probably as a result of being confined in an unstimulating environment (Kirkden and Broom, 2002). ADI Field Officers’ observation data and videotapes document stereotypic behaviors in all circus animal species studied. 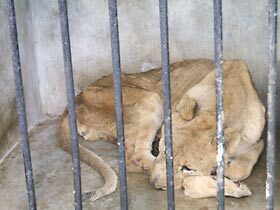 The scientific literature shows that carnivores, especially members of the cat family and bears, suffer from captivity. This evidence comes mostly from zoos, even though most modern zoos try to create a habitat as close to the animals’ natural environment as possible. 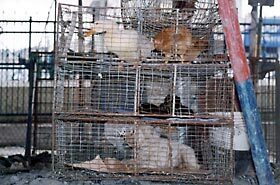 Due to the nature of traveling circuses, it is impossible to provide the animals with comparable environments. Therefore, any negative effects of captivity in zoos will be worse in circuses. Captive cheetahs suffer diseases that do not occur in their wild counterparts. These diseases worsen after transport, suggesting an environmental effect. When the cats were moved between facilities for breeding programs, eight of the 15 animals suffered an increase in corticoid concentration, and six exhibited a prolonged stress response. Of the seven animals who did not experience an increase in corticoid concentration, four had a single peak immediately after movement. The authors concluded that transporting the cheetahs caused the stress response. Corticoid responses increased when the cats were put on public display, and they decreased away from public view, thus indicating a negative welfare response to such exposure. The results of this study are not surprising. Cheetahs in the wild are solitary, have large home ranges, and avoid human contact. Carnivores frequently show stereotypic behaviors, such as pacing, in captivity. A study by Lyons et al. (1997) looked at nine species of cats in 11 different enclosures at the Edinburgh Zoo. The study found that “stereotypic pacing was recorded at various levels in 15 out of 19 cats (79 percent), the levels varying between 1 percent and 32 percent of scans.” The complexity of the animals’ enclosure was thought to play a big role in the incidence of such behaviors. A study on leopards (Carlstead et al., 1993), found that relocating cats to new cages provoked an initial increase in adrenocortical activity and increased hiding behavior. The cats failed to adapt to a new environment. Captive clouded leopards showed several signs of distress: a high number of stereotypic behaviors, apathy, self-mutilation (e.g., fur plucking and tail chewing), and intersexual aggression (i.e., mate injury and mate killing). They also achieved poor breeding success and experienced other health problems (Wielebnowski et al., 2002). Dogs have an inherent desire for social contact and are not suited to being confined alone in cages or kennels. Housing dogs alone results in boredom, under-stimulation and behavior problems. Visual and tactile contact with other dogs improves a dog’s psychological well-being and alters negative behavior patterns (Wells and Hepper, 1998). Both domestic horses and captive exotic equids, such as zebras and Przewalski horses (native to Mongolia), show a variety of stereotypic behaviors when stabled or confined, including, crib-biting, wind-sucking, wood-chewing, weaving, pawing, door-kicking, self-biting and head tossing (McGreevy, 2004). Domestic cats may show increased hiding behaviors as a response to stimuli or changes in their environment and to avoid interactions with other cats or people. They are more likely to respond to poor environmental conditions by becoming inactive and by inhibiting normal behaviors, such as self-maintenance (feeding, grooming and elimination), exploration, or play, than by exhibiting abnormal behavior (Rochlitz, 1999). “[N]either early training nor genetic selection can push the individual beyond its biological potential and a profound lack of stimulation is something to which no vertebrate animal is likely to be able to adapt” (Broom and Johnson, 1993).